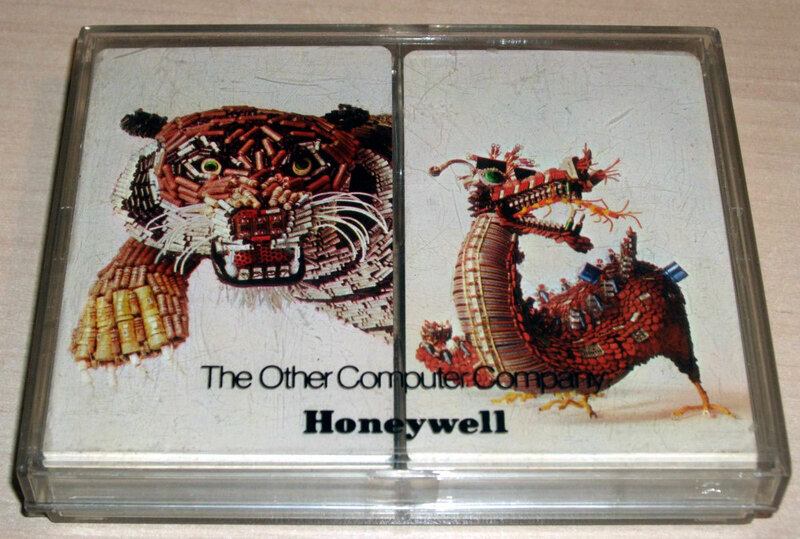 Promotional deck for Honeywell Computers by Brown & Bigelow c.1968 supplied as a dual-deck in a clear plastic box, with the cards marked in binary notation. The backs of the cards show two sculptures made from computer components of the time - wire, integrated circuits, transistors, resistors, diodes, switches, connectors, wheels and pulleys - by Jack N. Rindner. These animal sculptures also featured in Honeywell’s sucessful advertising campaigns for a number of years when they were competing against IBM to become the “Number Two” computer systems company, i.e. “the other computer company”. The tiger was supposed to say “Ignore the computer if you dare” whilst the dragon says “Honeywell’s new computers introduce a little magic to banking”. Brown & Bigelow’s “Nu Vue” brand was first produced in around 1960 and is mentioned on the joker in conjunction with the plastic coating. Above: Promotional deck for Honeywell Computers by Brown and Bigelow c.1968. Images courtesy Matt Probert.